Blueberry jam is a type of jam made from blueberries. It is made with washed blueberries, sugar, and lemon juice. Microwaving may speed up the process. It is used in many sweets. 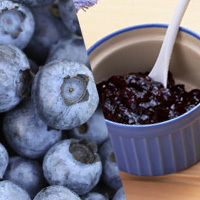 A single cup of blueberry jam contains 453 calories. That's 13 calories per teaspoon. The calories in Blueberry Jam per 21g(1tbsp) is 38 calories. Blueberry Jam is calculated to be 181Cal per 100 grams making 80Cal equivalent to 44.2g with 9.2g of mostly carbohydrates、0.15g of protein、0.06g of fat in 21g while being rich in vitamins and minerals such as Vitamin E Alpha Tocopherol and Manganese.